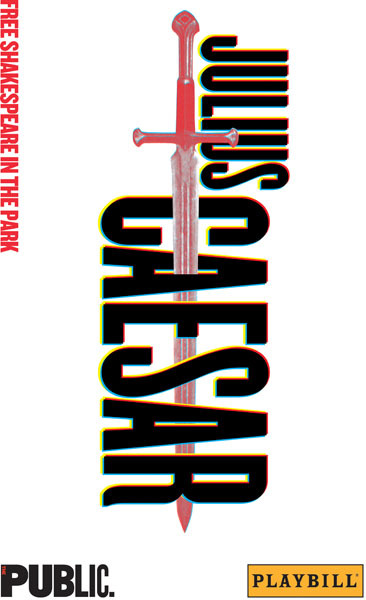 The most controversial production of the summer was the Public Theater’s Shakespeare in the Park’s “Julius Caesar.” What caused some funders to drop out and aroused a few to disrupt performances is that the title character (played by Gregg Henry) is made to look like Donald Trump. His wife Calpurnia is played by Tina Benko with an Eastern European accent. Director Oskar Eustis has defended his interpretation by arguing that the message of the play is that assassination is wrong. He’s right but the Caesar in this production is not the sympathetic figure Shakespeare intended. With Caesar made into a buffoon, Brutus (thoughtfully portrayed by Corey Stoll) becomes more reasonable. Also, there is a dynamic portrayal of Marc Antony by Elizabeth Marvel. Other outstanding actors play the conspirators: John Douglas Thompson as Cassius, Eisa Davis as Decius and Teagle F. Bougere as Casca. Despite the flawed presentation of Caesar, the production is fast-moving and exciting. If you want to laugh at the current administration, go see “Me the People: The Trump America Musical” at the Triad. Actually, the President isn’t depicted on stage but the rest of his family and cohorts are. The writer Nancy Holson and director Jay Falzone have borrowed familiar tunes and written new words. “How Do You Solve a Problem Like Maria” becomes “How Do You Solve a Problem Like Korea” and “Hotel California” becomes “Hotel Mar-a-Lago.” The four-member cast portrays the family members Ivanka, Jared and Melania as well as Betsy DeVos, Paul Ryan and Mike Pence (to remind everyone that if the President is impeached, he’s waiting in the wings). 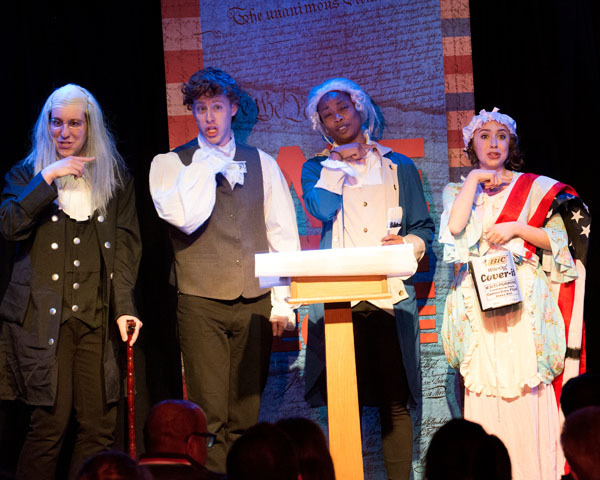 Bill and Hillary Clinton, a Russian spy named “Boris Buzzof” and even the Founding Fathers also turn up. The cast members– Aiesha Dukes, Mitchel Kawash, Richard Spitaletta and Mia Weinberger —are funny and can all sing. 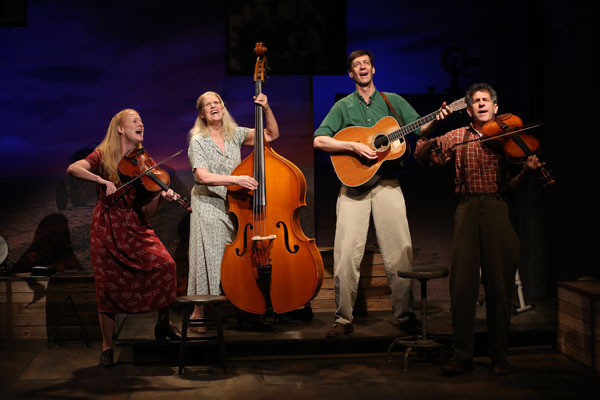 Another entertaining musical show is “Woody Sez: The Life and Music of Woody Guthrie” at the Irish Repertory Theater. The performers — David M. Lutken, Helen Jean Russell, Andy Teirstein and Megan Loomis — not only portray multiple characters but play multiple instruments. The two-hour show breezes through the life of Guthrie (1912-1967), the Oklahoma born folk singer/songwriter. Adroitly directed by Nick Corley, the action tracks Guthrie’s itinerant life, his battles with radio stations, and finally his death from Huntington’s Disease. From tragedies like the Dust Bowl, he created masterpieces like “Pastures of Plenty” and “This Land is Your Land.” There about 40 songs in the show, performed with gusto. “Marvin’s Room,” Scott McPherson’s 1990 comic drama, is being revived by Roundabout Theater in a production directed by Anne Kauffman. The play begins with Bessie (a caregiver for her ailing aunt and dying father) getting a blood test from a goofy doctor. It turns out she is suffering from leukemia. This leads to a reunion with her sister from Ohio, who comes down to Florida with her two sons to see if any of them are matches for a bone marrow transplant. The 18 year old didn’t even know that his mother had a sister. The setup doesn’t seem very credible and the work strikes me as closer to soap opera than tragedy. That said, the cast plays it for all its worth: Lily Taylor and Janeane Garofalo are the sisters, Celia Weston is the aunt and Jack DiFalco is the troubled teenager.